Bacon inspires me. When there is cured pork belly at my abode it’s an all-out gastronomic show down. This week it's been used in gratines, chili, and now a fluffy frittata. A frittata is essentially a quiche sans crust, and it is an easy yet deceiving dish. Many of my past attempts have been served directly from the pan. Not because I found it appealing, but because they wouldn’t budge.The secret to a smooth ride out of the pan is bacon drippings. Oh yes. Follow the steps below for a flawless performance in the kitchen… just don’t skip the bacon, for cryin’ out loud! Slice the bacon in to small pieces and cook in a large heat proof sauté pan over medium heat for 10 minutes, stirring occasionally for even cooking. When crisp, remove bacon with a slotted spoon, and pour drippings in to a small bowl, leaving 1 teaspoon in the pan. Add sliced mushrooms and cook alone for five minutes. Once the mushrooms are browned, add onion, spinach, a dash of salt and pepper. Cook until spinach is wilted. Remove vegetables and place to the side to cool. Rinse and dry the pan. In a large bowl, crack and whisk 12 eggs with 1 tablespoon of water. For a fluffy frittata, whisk for at least 3 minutes to incorporate more air. Whisk in salt, rosemary, red pepper flakes, garlic powder until incorporated. Fold in ricotta cheese leaving some clumps in the batter. Fold in the vegetable mixture, half of the pecorino Romano and half of the bacon. Heat 1 tablespoon of the drippings in the sauté pan over medium heat, coating bottom and sides evenly. Pour in egg mixture; spread vegetables evenly. Cook over medium heat until frittata is just set at edges, about 10 minutes. Sprinkle remaining bacon and Romano over eggs. Transfer the entire pan in to the preheated oven and bake until just set, about 15 minutes. Loosen the sides of the frittata with a knife, and slide on to a platter. Let cool 30 minutes. Slice into wedges and serve. 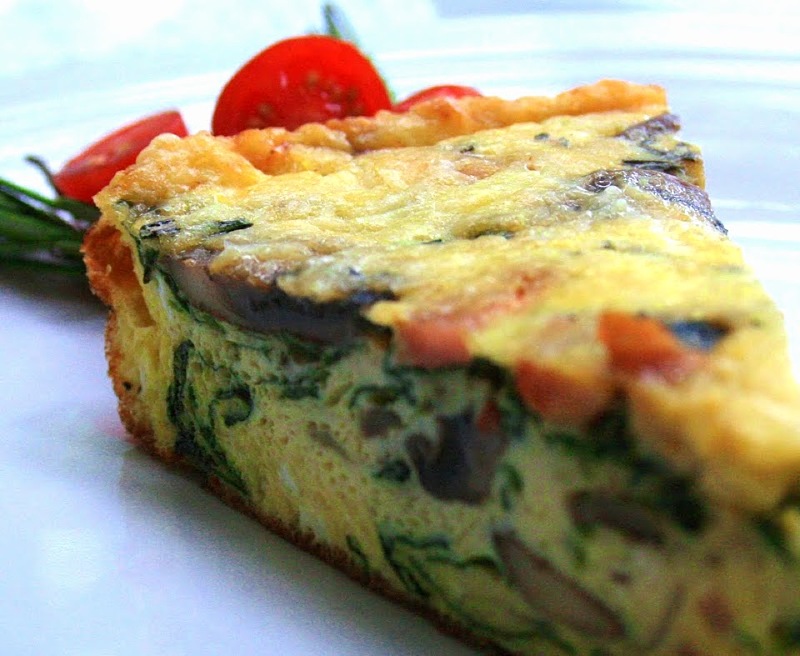 Frittata can be served warm, at room temperature or cold. So true. Bacon is my dear, dear friend. 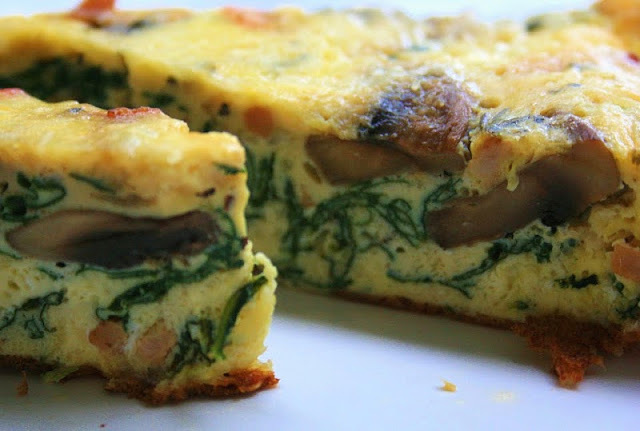 Will have to give this frittata a try. I would very much like you to join by blog as a guest blogger. And blog about food / cooking . If interested my email is at bottom of my website.